Gibberish is defined as «Spoken or written words that have no meaning». In this article I'll present a Gibberish Generator, but before doing so I'll discuss some programming features that makes it relatively easy to make such a generator in Perl 6. The value is the number of times the key was present in the array. The value «1» is implicit, and is not shown in the output above. If you assign a BagHash to a hash variable (a variable with the % sigil), it will be coerced to a hash. See docs.perl6.org/type/BagHash for more information about BagHash. When we use pick to give us a random value from a list (or array), we get one of the values at random (with equal probability for each of the elements). But when be do the same on a BagHash the weight (or frequency) is taken into account. We set up a normal hash, with the word «This» as the only key. The value is a BagHash of words (the keys; «is» and «was») with weight (the values «9» and «1»). We apply pick on the BagHash to get a word (either «is» or «was»), and increase the counter for the chosen word by one. And finally we print the numbers. The distribution is almost spot on; at about 90% for «is» and 10% for «was». Up to now I could have used the Bag type instead of BagHash, but that will not work in the code in the rest of the article. See docs.perl6.org/type/Bag for more information about Bag, if you want to know more. The Gibberish Generator starts with a real text, and builds up the structure where we have a hash of all the words, with a BagHash of the words following it together with the weight (or frequency). Then it selects the gibberish words according to the weight, and the BagHash and pick combination gives us almost everything we need for free. The return value from the procedure; a hash of words, where the value is a BagHash of words following it (with the weight). The start problem is tackled by hard coding it as "" (an empty string). Then we iterate through the list of words. If we haven't encountered the left side word before, we initialise the BagHash. If we skip this, we'll get an automatically created hash when we access it in the next line. And that would be bad. Then we add to the weight of the word combination. And remember the word, so that we have a left side the next iteration. Returning the word frequence data structure. 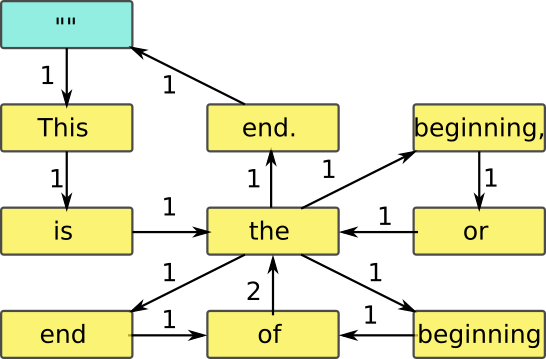 Using words works pretty well, but note that it splits the string on space characters only, so punctuation characters are not removed from the word they are attached to. Printing the words in the hash, and the BagHash structure. Note the start and end in the upper left corner (marked with ""), and that all the weights are 1, except for of -> the which is 2. Equipped with the «NextWord» module, and our knowledge of pick we can make a Gibberish Generator. We feed the program with a real text, and it gives us back gibberish based on a weighted random selection of neighbouring words in that text. We specify a file to use as source. The where clause is there to ensure that it is a (readable) file. The optional $limit value is used to specify the numbers of words to produce. It defaults to «1000». We use slurp $file to read the file in one go, apply words on it to get a list of words, and passes that list to the module. This is important, so that we can get the first word (which is the same as the first word in the original file - as that is the only one with an empty left side). Then we pick one word at the time, printing it. We have to insert sections ourself, as words doesn’t recognize newlines (it actually ignores all sorts of whitespace), so the result would have been one very long line. I have chosen to add a newline after a word ending with a period - with a 20% probability. Counting down the number of words. If we have reached the limit, we go on until we get a word ending with a period (to get a graceful stop, and hopefully something that looks like a complete sentence) before actually stopping. Note that we don’t have an end pointer so if the program goes there - and we have no other word used after that one somewhere else in the text, it will fail when it tries to access the next word. And what happens if it chooses «This» → «is» → «the» → «end.» And then tries to go on? and passes an empty string if we read an empty line (to indicate a new section). Adding the words (with append instead of push so that we have one list). Adding the end pointer that I (on purpose) forgot on the first try, as it didn't fit in with the very compact code reading the file, getting the words and passing them on to the module - in one line of code. And off we go, letting the module do the job. This one will now match at either the very first word - or after an empty line (a paragraph). So the very first word in the output will be the first word in any of the sections in the input file. Pick one word at a time, printing it. And we do this until we have reached the word limit, and found the end of a paragraph. We start by picking the first word with "" as index (marked with  in «gibberish2»), and this gives us one of «I», «This» and «Support». When we encounter the end of a paragraph (an empty text; marked with  in «gibberish2») we print a paragraph (marked with  in «gibberish2»), and goes on to select the next word - which is the first word of the new paragraph. And again, we start with "" as index, so it does the same as for the very first word. The end pointer (from «value.» to «») ensures that the very last word in the source text has a successor. I don't recommend using this to produce text in a professional setting (unless the aim is to annoy the readers), but if you do, use it on plain text without headings and other "noise" that messes up the randomness (as e.g. a play manuscript with role names and stage directions). Quotes and parens will stand out if they are unmatched, as they are almost certain to be. They are partly amusing, mostly incomprehensible, and utterly devoid of any meaningful meaning (so to speak). At least compared to the original text.